We are back in NYC and I'm so excited to have a more permanent home again...which means cookings and blogging about cooking! Of course we have one more back-dated blog post about Sichuan, which is near completion. But first I cannot wait to write about making (for the first time) one of my favorite classic Chinese snacks. After a dreadful NYC winter (or so I've been told as I wasn't here to experience it) it's actually starting to get warm again, and this means liang fen season is in. I am THRILLED to have recently learned how to make this on my own. Sometimes I wish chinese dishes could be translated into more thoughtful english names to avoid causing mass confusion and alarm when telling people they are having "the married couple's sliced lung". However, other times I absolutely love the unabashed naming convention. Luckily, liang fen isn't scary at all, it's just mung bean jelly noodles. Easy! Liang fen is also thoroughly delicious and addicting. It is also vegetarian, vegan and gluten friendly....I think I can safely say that this is a health-freak trifecta that is rare to find in any Asian dish. 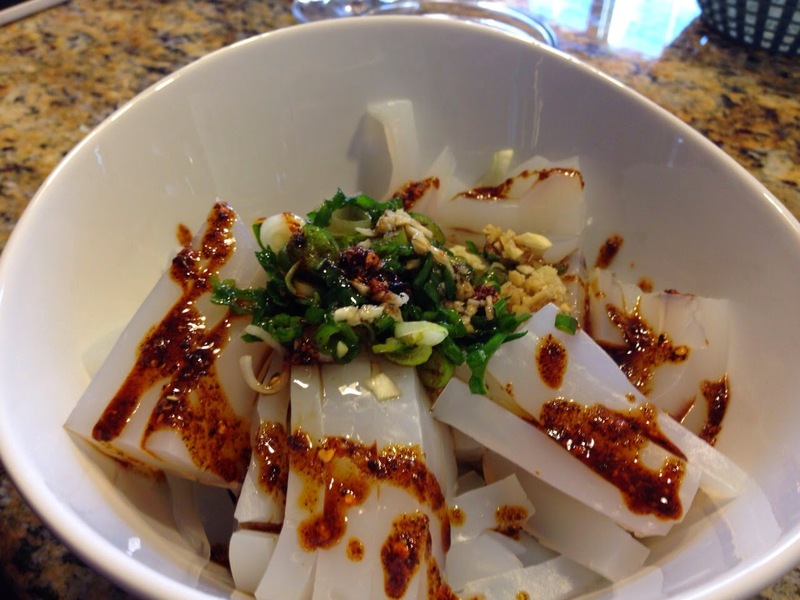 Liang fen is a jelly that is made from mung bean starch, which is set firm in the fridge and sliced into cubes, strips or often times long noodles. The jelly provides the smooth texture while the flavor comes all from the delicious sauce. I prefer mine with a spicy sichuan peppercorn sauce detailed here. I've also had it with peanut and sesame sauce that is pretty tasty too. This ratio made enough for 4 (very hungry) people. Heat up 2 cups of water on the stove. At the same time, mix 1/2 cup starch with 1/2 cold water until smooth. Slowly stir in the starch mix into the water and then turn the stove off and keep stirring. It will become opaque quickly. Then pour into a pan, cover with plastic wrap and set for at least 2 hours. First step is making the sichuan chili oil. To do this, heat up the peppercorns slightly on the stove until they start to get a little smokey. Remove and then grind up in a mortar or coffee grinder, it will smell amazing. Then combine with the chili flakes, sugar and salt. Heat up the oil, add in the chili/peppercorn mixture allowing it to sizzle a little, and then turn off the stove immediately so it doesn't burn. There you have the chili sauce. Then add in all the other ingredients, except for the scallions, and it will smell like crack. After the jelly has firmed up, it can be sliced pretty easily into whatever shape you want, although strips are the norm. Then toss it with the sauce and chopped scallions. Mmm mmm mmmmmmmm.